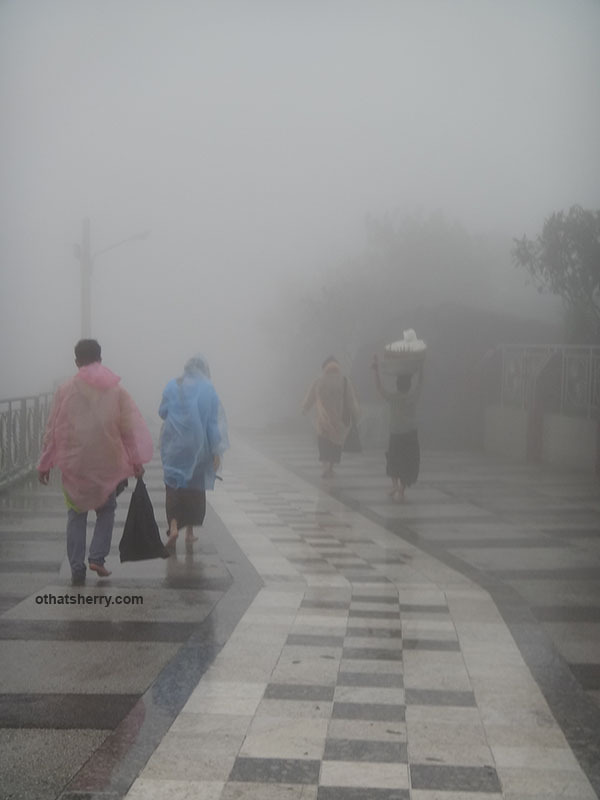 Myanmar’s wet season, which lasts from May to September, is W.E.T. — with all letters capitalized. 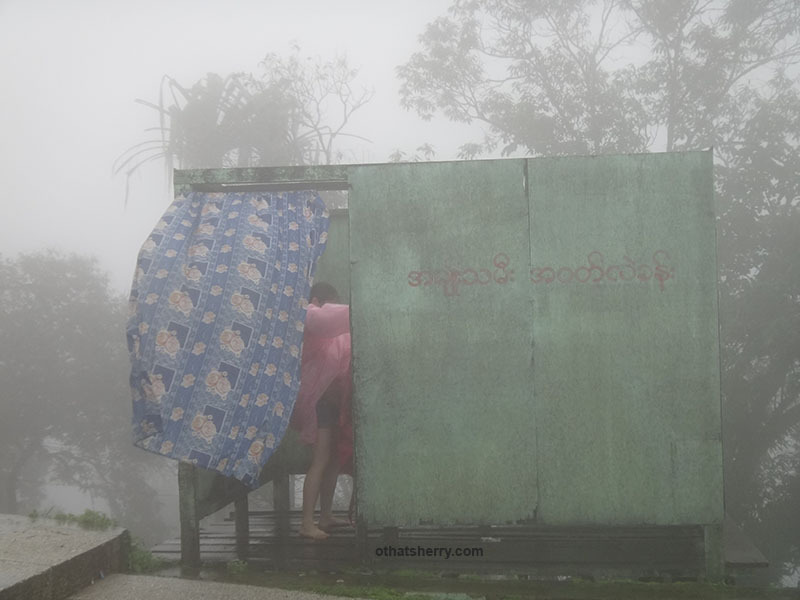 I had read about the wet season in my guidebook and was prepared for (daily) heavy rain, but I didn’t expect this kind of rainstorm up in Mt Kyaiktiyo! Kyaiktiyo, home of the sacred golden rock, is one of the most important religious pilgrimage sites in Myanmar. Legend has it that the large boulder is able to maintain its precarious balance because its stupa holds a strand of the Buddha hair. From Kinpun, the base camp, you have two options to get to the rock. Hike all the way (approx 7 miles) there, average time is between four to six hours. 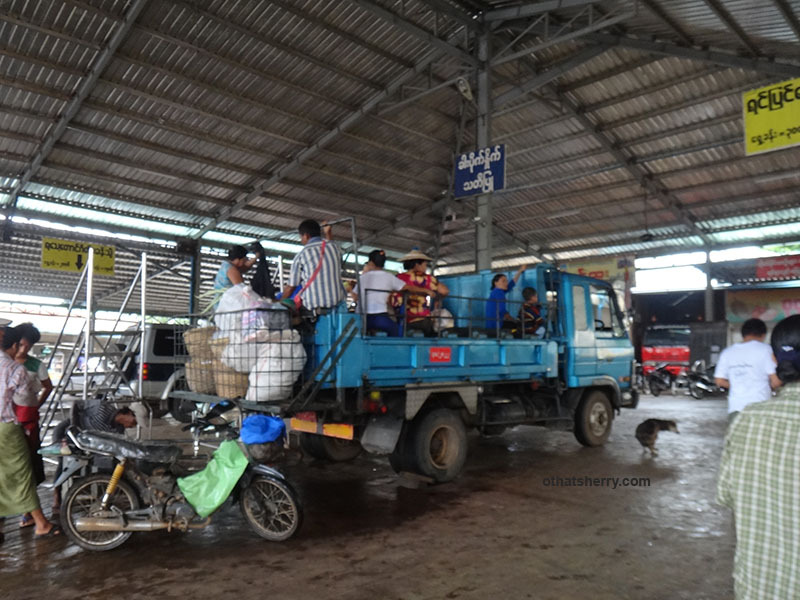 Ride a truck to the Yatetaung bus terminal, average time 45 minutes. Most people choose the second option. The ride costs K1500/person one-way (roughly $1.50), but that price depends on whether or not there are enough passengers. If there are not enough passengers, you will have to pay more to make up the difference. The trucks, with wooden benches, sit 35 or so people and do not leave unless they are really packed. This is the truck that takes everyone up the mountain. For those who failed to grab a seat, stand or just hang on. Yes, packed. Going up the mountain, our truck packed — including children and those hanging off the end of the truck, 40 people. I was thoroughly enjoying myself. Sitting in the third row, I was squeezed between my travel buddies and three adorable Mon girls. The six of us were crammed in one row, with no personal space whatsoever, and… I LOVED it! Heck, forget about personal space, I want to be smack in the middle of actions. This is what I would call an authentic travel story! Well, then it started raining, pouring. By the time we got to the bus terminal, it was a tempest. 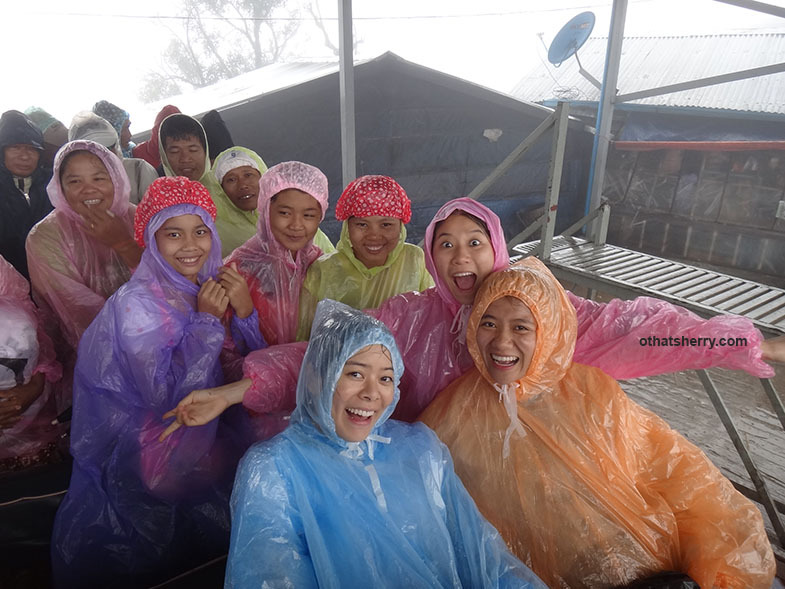 Our so-called-raincoats (really just colored trash bags) that we bought from the locals were useless, they tore before we even put them on. We were damped and cold and miserable. We each bought a second raincoat and layered it on. The wind blew so hard we had difficulty walking. From the terminal, we walked for another 45 minutes or so before we finally reached the rock. After the bus, we entered the temple shoeless and made our way to the rock. The walk was not difficult, nor was walking barefoot. Nonetheless, the task required some effort. The journey, in my opinion, was what made the pilgrimage to Kyaiktiyo sublime. Literally and metaphorically, the journey served as a form of cleansing. It removed us from the worldliness below and transcended us to a holier sanctuary. Looking back on Kyaiktiyo, I realized that the central feature of my travel stories is deprivation, or the “lack of.” The whole point is to remove myself from the conveniences of everyday life, that when I finally get the little things, such as hot water, that it would filled me with gratitude and (almost) bring me to tears. This entry was posted in Southeast Asia, Travel and tagged Burma, Golden Rock, JUL 2013, Kyaiktiyo Pagoda, Myanmar on August 5, 2013 by Sherry. I think the changing room photo illustrated the monsoon quite well… “oh, blasted wind!” is such a mild way to describe what was happening! “mild way,” haha, I see, how would you describe that “blasted” tempest?